Enjoy trying these homemade pound cake recipes and make one of the world's oldest, most popular dessert cakes. Pound cakes are traditionally richly dense in texture and large. They tend to be served plain, dusted with powdered sugar, lightly glazed, or sometimes decorated with an unpretentious icing. This is a recipe for "pound" cake that Mom used to make. Notice how all the ingredients are measured exactly to one pound. Cream the butter and sugar together, then add beaten whites of eggs, after the yolks, and 1/2 teaspoon baking soda dissolved in a tablespoon of milk. Put 1 tablespoon cream of tartar in flour, also a pinch of salt. Add lastly lemon essence to taste. Bake 30 minutes in moderate oven. Cream shortening and sugar well, then beat in one half the sifted flour and salt. Then add the eggs which have been well beaten, and the extracts. Next, beat in the remaining flour. This batter must be thoroughly beaten. Pour into a greased slightly floured pan, having the batter higher on the sides than in the center. Bake in a slow oven (325°F) about 35 minutes. Cool, cut into cubes with sharp knife and ice or dip in fondant. (Of course, any good white icing may be used.) Then dust with silver candies, chopped nuts, or shredded coconut. Shred the peel very finely, taking equal quantities of orange, lemon, and citron. Blanch the almonds, and chop them finely. Sieve the flour onto a sheet of paper, and add the peel and almonds to it. Put the butter into a clean bowl, and beat it up to a light cream with the hand; then add the sugar, and give it another good beating; add in the eggs one at a time, beating them after each addition of eggs, and when all these ingredients are in, add the flour and carefully mix, using a little milk, if necessary, to bring the mixture to a proper cake batter consistency. Turn the preparation into round tins, lined at the bottoms and sides with white, greased paper. Bake it from 1-1/2 to 2 hours, and let the oven be well heated when the cake is first put in, otherwise, the currants will all sink to the bottom. A glass of wine is sometimes added to the mixture, but this is scarcely necessary, as the cake will be found quite rich enough without it. The above quantity can be divided in 2 or more cakes as desired. This is the old fashioned pound cake that our mothers used to make, and it can be kept for weeks in an earthen jar [container], closely covered, first dipping letter paper in brandy and placing over the top of the cake before covering the jar. Beat to a cream one pound of butter with one pound of sugar, after mixing well with the beaten yolks of twelve eggs, one grated nutmeg, one glass of wine, one glass of rose water. Then stir in one pound of sifted flour and the well-beaten whites of the eggs. Bake a nice light brown. One-half cupful of butter, two cupfuls of sugar, one cupful of milk, and five eggs, beaten to a stiff froth; one teaspoonful of baking soda and two of cream of tartar, stirred into four cups of sifted flour. Beat the butter and sugar until very light; to which add the beaten yolks, then the milk, the beaten whites of eggs, then the flour by degrees. After beating all well together, add a small coconut, grated. Line the cake pans with paper well buttered, fill rather more than half-full and bake in a moderate oven. Spread over the top a thin frosting sprinkled thickly with grated coconut. Stir two cups of butter to a cream, then beat in the following ingredients each one in succession: one pint of powdered sugar, one quart of flour, a teaspoonful of salt; eight eggs, the yolks and whites beaten separately, and a wineglass of brandy; then last of all add a quarter of a pound of citron cut into thin slices and floured. Line two cake pans with buttered paper and turn the cake batter in. Bake in a moderate oven about three-quarters of an hour. Cream the butter, then add the sugar gradually and beat until white and curdled. Beat the yolks until thick and lemon colored, add them gradually to the creamed butter and sugar and beat fifteen minutes. Sift the flour and baking powder six times and add to the mixture a little at a time, beat five minutes, add sherry and rose water gradually, beating all the time. Whip the egg whites very stiff, then add them lightly to the other ingredients. Bake in a pan with a tube, about one and one-half hours, not allowing it to brown over the slightest until as high in the pan as it will be. This is a rule to follow in all cake making, but more particularly with a cake containing so many eggs. Sugar, 1 pound (2-1/2 cups); butter, 1 pound (2 cups); flour 1 pound (3 cups); 10 eggs; soda, 1 teaspoonful. Directions: Beat the yolks and whites separately; and if you wish a fruitcake, use raisins, or currants, 1 pound. Remarks. —It keeps moist a long time, if properly covered. For varieties sake, flavoring extracts may be sometimes used or take the Imperial Cake below, for the variety. Sugar, flour, butter, eggs (10), raisins, currants, figs, almond meats, peel (1/2 citron, 1/4 lemon, 1/4 orange), of each 1 pound, except as explained about the peel, baking powder, 3 teaspoonfuls. Directions: No flavoring, nor spices, are to be used. The butter and sugar rubbed together, then add the beaten eggs (10 eggs average a pound); add baking powder to the flour and put it in after the eggs; add only one kind of the fruit at a time — no flour on the fruit — but the peel and figs are to be chopped fine, the almonds blanched and split. Stir well when all is in, and bake in square tins. Remarks. —I should think it would be rich enough for any Imperial family of Europe, or for the wedding of an American, but, in this case, the company to be large, the amounts may be doubled, or trebled. 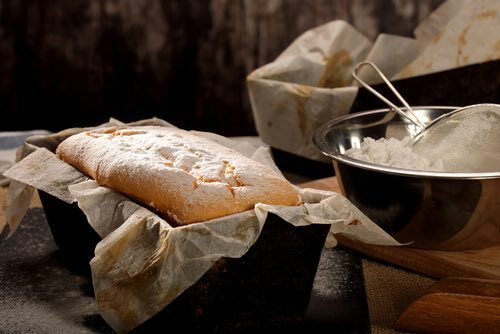 Pound cake is traditionally made with four main ingredients: one pound each of flour, eggs, butter, and sugar. It has its origin in Northern Europe, in the early 1700s, and it became popular in the British Isles before crossing the Atlantic to North America. The pure simplicity of its ingredients made it an easy to remember recipe in the days before published cookbooks were widely available and before many cooks could read. 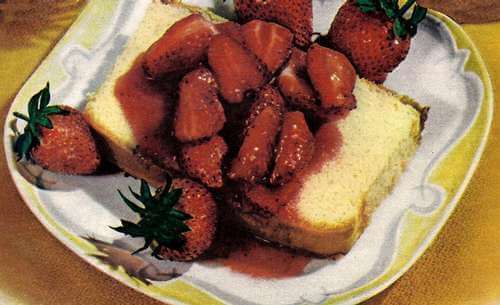 The early pound cakes used no leavening agent other than the air beat into the batter during their preparation. 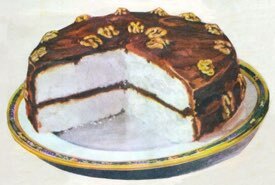 Cooks know to give the batter "a good beating" to avoid an over dense cake, though by their nature pound cakes were famously rich and dense. 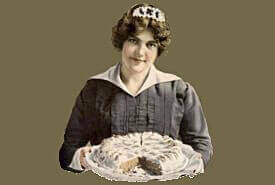 By the 1900s, baking soda and baking powder were being used as artificial leavens to produce a lighter textured cake. 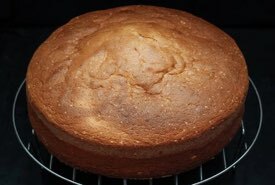 Homemade pound cake recipes come in numerous variations of the traditional recipe, each region having its preferred flavors and using different proportions of the traditional ingredients to make cakes of a smaller size and lower cost.